← How much clutter do you have around your home? One of our first homework exercises we do in the Clearing Clutter Support Group and it is amazing what insights come out of this. Shopping, finding things, getting things given to you from well meaning friends or family, mail and flyers coming in that we did not ask for. It’s amazing how much stuff comes into our homes without our permission or without us really thinking too much about it. 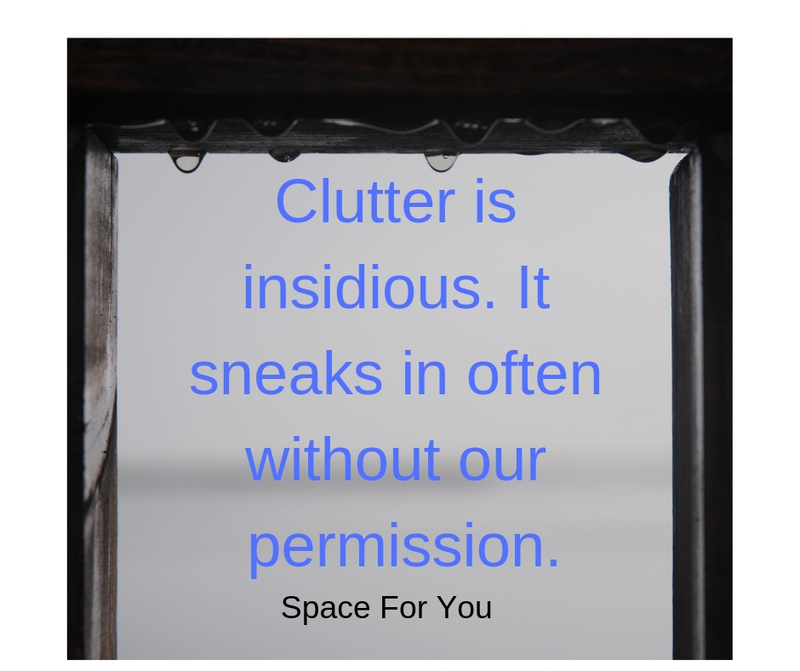 The good news is that awareness of what we acquire and how much is usually an area that people who have challenges with clutter can get a handle on very quickly. Having an awareness of how you feel when you are looking for and finding a treasure is key. You may be on a high when you are on the hunt or when you have found something that you know you cannot live without. You may be trying to soothe yourself because you are having a hard time, feeling sad or depressed and you just need to forget about that for this moment and get yourself a little something to lift your spirits. Is there something else your could be doing that gives you that same reward? Paying attention to your emotions and feelings are so important to help you to be able to make changes in this area. Are you able to think in that moment about whether you really want, need or love this item or are you on automatic pilot and just feel you can’t stop yourself? Are you purchasing items that come home with you only to be left in the bag, tossed in the corner not to be found again for months or even years? Are you actually able to find these things in order to give them to the intended recipient? Think about how you feel, compared to when you acquired the item, to how you feel when you get home. Your feelings may have changed. You may be thinking “oh no, where will I put this” or “I am afraid to look at my balance in my bank account now”. Check in with yourself often. How distressed or uncomfortable would you feel if you could not acquire something you wanted? How strong is your urge to buy or acquire free things for which you have no immediate use? To what extent has your saving or compulsive buying resulted in financial difficulties for you? How often do you feel compelled to acquire something you see, e.g. when shopping or offered free things? How often do you actually buy (or acquire for free) things for which you have not immediate use or need? Pay attention to what you acquire over a week and see what comes up for you. You may be quite surprised!! This entry was posted in acquiring items, chronic disorganization, compulsive acquiring, difficulty Discarding, Organizing and tagged compulsive shopping, emotional shopping, hoarding, Making Change. Bookmark the permalink. 2 Responses to How Much Difficulty Do You Have With Acquiring More Stuff? Kimberley- Awareness is the beginning, or the opening for change. Without that, there will be no movement forward. The questions you shared are useful for starting that self-reflection. Thank you Linda. Yes, awareness is key and one of the main “ah ha’s” that happen in the Clearing Clutter Support Group.